Pasteurizing is an important part of our service. 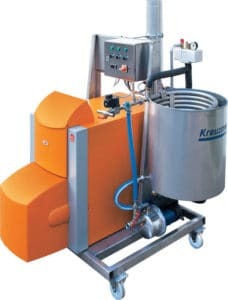 The pasteurizer onboard the Mobile Juicing trailer processes up to 1200L of juice/hr. It is specifically designed to hold the product for a set period of time at a set temperature. The operator sets the temperature up to 90 Degrees C.
Raw juice drains over a gravity filter into an onboard buffer tank. From there, it is pumped through the pasteurization lines. Using a coil-in-coil system, the juice travels through the inner tube which is heated externally with hot water. After pasteurization, the product is kept warm in a heated buffer tank so it retains its heat for hot filling. Hot filling also ensures the sterility of the packaging. Pasteurizing kills the necessary bacteria, pathogens, and spoilage microorganisms to ensure safety and shelf stability. Unlike Ultra High Temperature pasteurizing, the flavor of the juice is preserved due to relatively low temperature and short heating time. Pasteurization is a large part of our food safety plan because we want to ensure we provide all of our clients and their customers with a safe product.